As a kid our Italian neighbor served this sautéed escarole at room temperature, but whether at room temperature or hot out of the pot, it makes a refreshingly delicious side dish. Like spinach, it wilts down considerably when cooking so plan on only three or four servings per head of escarole. 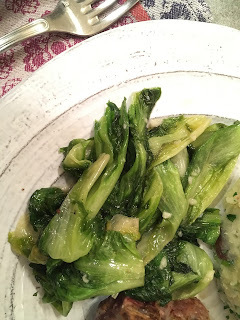 While you heat a large heavy pot over medium heat peel off any browned outer leaves from the escarole, cut out the tough bottom stem, and break apart leaving the leaves whole. Add some salt, chopped garlic, and a generous pour of olive oil to the pot, then a few minutes later, the escarole. Stir often with some tongs or a pair of spoons until it’s fully wilted, then drizzle some of your best extra virgin olive oil over the top.